I promised you the recipe for these cupcakes, and I didn’t want to disappoint! I had a few ideas in mind for my friend’s birthday, which perfectly coincided with the academy awards, but I’m so glad she chose these! I made them once before for another birthday, but for some reason decided I didn’t like the pictures I took, and so never posted the recipe. Of course with the business of the party, I didn’t get around to taking any better pictures this time, but in retrospect the ones I took way back in June aren’t bad! In fact, they look so delicious, they kind of make me want to make these cupcakes again! I really made my day when one of the guests at the party said, “Seriously…These look so good, I thought they were from Cake in a Cup! ” – which is the local cupcake place that happened to have won Cupcake Wars. The truth is, it’s pretty easy to make these look professional, and as long as you follow the recipe, you can’t go wrong with taste. 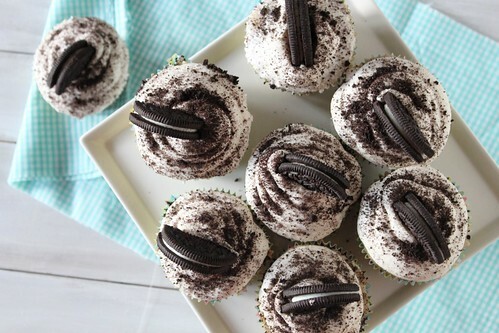 In fact, I think these cupcakes are even better then any you could buy, because I don’t think too many places put a half an oreo on the bottom of the cupcake, and then another 20 in the batter. Let’s just say this isn’t exactly a “light cupcake”…like seriously when you pick it up you will be like, OMG this is heavy! But it is SO good! In order to get half an oreo with the frosting on the bottom of the cupcake, I ended up using a sharp knife to get the frosting all on one side. I tried the old “twist” method, but ended up breaking (and then eating) a few too many oreos. Overall you will need 56 oreos for these, so be sure to buy 2 packs. 1) Preheat the oven to 350˚ F. Line the wells of two cupcake pans with 24 paper liners. Place an Oreo halve in the bottom of each liner, cream side up. In a medium bowl, combine the flour, baking powder and salt; stir together with a fork to blend and set aside. 2) In the bowl of an electric mixer, combine the butter and sugar and beat together on medium-high speed until light and fluffy, about 2 minutes. Blend in the egg whites one at a time, beating well after each addition. Blend in the vanilla extract. With the mixer on low speed, beat in half of the dry ingredients just until incorporated. Add the milk and beat just until combined, then mix in the remaining dry ingredients. Gently fold in the chopped Oreos with a rubber spatula until evenly incorporated, being careful not to over-mix. 3) Evenly divide the batter between the prepared cupcake liners. Bake for 18-20 minutes, rotating the pans halfway through baking, until a toothpick inserted in the center comes out clean. Allow to cool in the pans 5-10 minutes, then transfer to a wire rack to cool completely. 4) To make the frosting, combine the cream cheese and butter in the bowl of an electric mixer and beat on medium-high speed until smooth, about 1 minute. Blend in the vanilla extract. Beat in the confectioners’ sugar until incorporated and smooth, 1-2 minutes. Add the heavy cream to the bowl and beat on medium-low speed just until incorporated, then increase the speed to medium-high and whip for 4 minutes until light and fluffy, scraping down the sides of the bowl as needed. 5) Frost the cooled cupcakes as desired, I used a large round tip with a pastry bag. 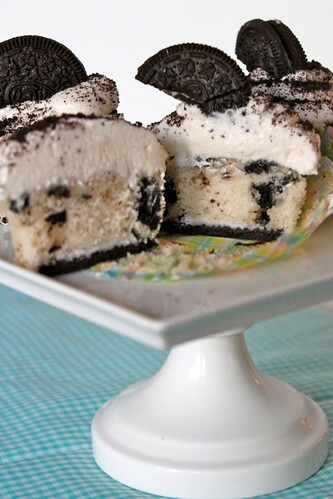 Sprinkle with Oreo crumbs and garnish with Oreo halves. This entry was posted on February 28, 2013 by Spice Is Nice. 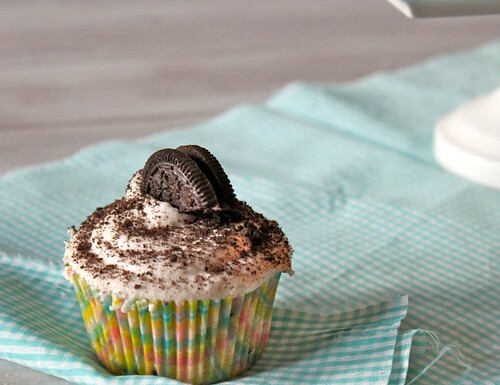 It was filed under Cupcakes, Dessert and was tagged with cookies and cream, Cupcakes, oreos.